Climate Interactive is building a community that creates, shares, and uses credible models, accessible simulations, and related media in order to improve the way leaders and citizens around the world think about the climate. Their purpose is to get these sims and insights into the world as accessible products so they can be tweaked, enhanced, translated, distributed and used to power change around the world. They’re building sims that are easy to use by climate analysts, communicators, and leaders of many types, and that provide immediate feedback, so users can see the results of different scenarios on atmospheric carbon levels and temperature. And they're sharing their own analysis so that leaders have access to powerful insights. In particular, the "Climate Action Initiative" which includes policy leaders such as Dr. Robert Corell is using our simulations to make change at the highest levels of governments. C-ROADS is being used within international climate negotiations. The United States Department of State has used the C-ROADS simulator to understand the climate impacts of various country-level proposals and to share that understanding with other parties to the UNFCCC. Don’t simulations like this already exist? Not really. Most existing energy and climate models are extremely complex, take days to run, and can’t be used by untrained people. Climate Interactive is working to change that. The Climate Rapid Overview and Decision-support Simulator is a 7-20 region, policy-maker-oriented climate simulator that has undergone scientific review and is being used in support of international climate change negotiations. Responding to climate change requires us to think clearly about the future. And one of the things we know about climate is that the economic, atmospheric, and social systems that drive the climate defy most human intuition. So we need a way to see the future without waiting for it to arrive. And it turns out that simulation models are very good at helping us do that. So if we want to change the future, let's play it first. Project partners, including the Sustainability Institute, Ventana Systems, and MIT, are building a set of simulators with engaging interfaces and compelling output displays. These sims will allow learners, step by step, to deepen their understanding of climate dynamics, from the most rudimentary “carbon accounting” to progressively more complex explorations of strategic options for reducing emissions and their likely effects. Climate Interactive is being built as a Web 2.0 platform to enable climate-related simulation use and sharing. They will be gathering, documenting, posting, and promoting various climate models and pieces of climate models for use by other modelers. For example, another model builder might download a model of the carbon footprint of an electrical utility in order to learn from it and adapt it. They will also be posting climate-related models as web services that other programs can call, similar to how programmers have extended Google Earth to include maps of sea level rise and other impacts of climate change. In addition, they’ll post the HTML code for user interfaces and document the connection to the model that sits beneath it, so others can customize their own simulations to reach their desired audiences while using our suite of simulation models. It means that thei work can be adapted for use by corporate leaders, green investors, UN negotiators, or high school science classes in multiple languages and levels of scientific complexity. We hope to tap into the creativity and collective intelligence of many people around the world to improve and extend our simulation interfaces — and extend their impact through videos, podcasts, essays, and other media. 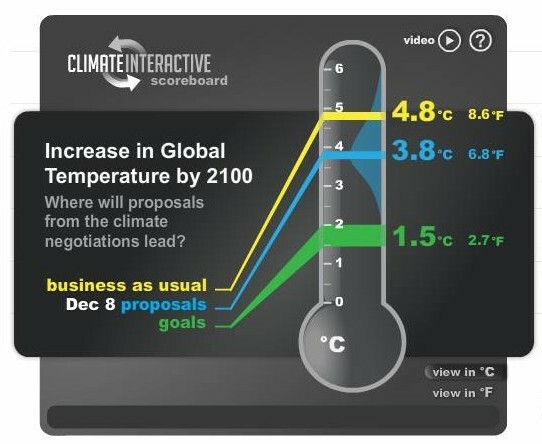 The Climate Scoreboard uses the C-ROADS simulation to calculate the long-term climate impacts of proposals under consideration in the negotiations to produce a global climate treaty. Embedded Scoreboards automatically update as the deal improves. Watch the video for background and explanation of features: The Climate Scoreboard Video. How Does Climate Scoreboard Work? Just as decision makers and negotiators need ways to assess the discussions towards creating a global climate treaty, advocacy groups and citizens around the world also want to know: how close do current proposals bring the world to climate goals such as stabilizing CO2 concentrations at 350ppm or limiting temperature increase to 2°C? The challenges of adding up proposals that are framed in multiple ways and the difficulty of determining long-term impacts of any given global greenhouse gas emissions pathway are just as present for citizens as they are for policy makers and political leaders. With these facts in mind, Climate Interactive team is tracking the proposals under consideration and using the same climate change simulation available to policy-makers to report their estimate of how close proposals come to realizing climate goals. 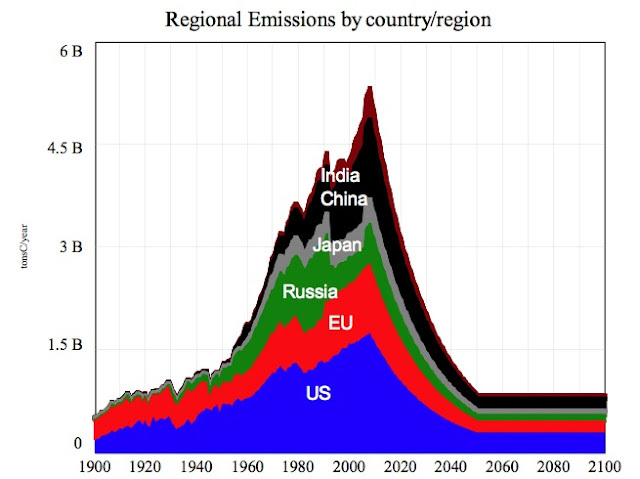 In the run-up to COP-15, they are scanning UNFCCC submissions and news sources from around the world to collect a list of what they call “current proposals” – possible scenarios for greenhouse gas emissions by UNFCCC parties. They share their compilation and use the C-ROADS-CP climate simulation to calculate the expected long-term impacts if those proposals were to be fully implemented. During the Copenhagen Conference they will be updating their assessment in as close to real time as they manage. The data tables and graphics will change to reflect the current 'state of the global deal' and if you have embedded the Scoreboard widget on your own website it will automatically update if the negotiating positions shift.